Last night Boston Public Schools Superintendent Carol Johnson presented a revised plan to move from a 3-zone to 5-zone map for student assignment. Here are links to the presentation and memo which include the the Allston/Brighton zone that was included in the previous version of this plan. BANK ROBBERY: Brighton, Sovereign Bank at 30 Birmingham Pkwy, suspect passed note, no weapon shown, bank robbery task force is responding. 109 Fanueil Street - Change the legal occupancy from one-family dwelling to a two-family dwelling. Lot size insufficient for additional dwelling unit. Location of the main entrance. Side yard insufficient for new access stairway. In a modest step in the right direction, Harvard has removed the 6' tall chain link fence that ran along the Everett St side of the huge, unfinished Lincoln St building for the past several years. It looks like it will be replaced with a much nicer strip of green. CWP meeting story in the Crimson - Where should our planning focus be? The Harvard Crimson reports on last night's A/B North Community Wide Plan meeting in this story and I was told the presentation shown by the BRA at the meeting will be posted on the CWP website (though it isn't there yet). Regarding the quotes that Sal and I have at the end of the Crimson story, we have been told by the City's Chief Planner that Charlesview relocation is going to move ahead soon, and I think this is an opportunity that we should welcome. The empty KMart isn't good for anyone, new housing will be good for Charlesview, and the whole project should have a variety of benefits for Harvard and everyone else. Considering the immediacy of this, the largest non-institutional development that has ever, or will ever, happen in our neighborhood, I see no reason for us to spend time now pondering the future of the Riverview Triangle (the wedge of land between Soldiers Field Rd and Birmingham Parkway - home to Martignetti's, Staples, Acura of Boston, IHOP, etc.) Decades from now that may be a very different area, but right now it isn't going anywhere and doesn't impact decisions about design, economic integration, creation of new retail space, public parkland, demographics of new housing, or much of anything that is germane to how several hundred new neighbors can best be added into the Brighton Mills area. Markets change, plans change, owners change, politics change, and history is filled with examples of developments that bear little or no resemblance to what was planned. For example, the North Allston Strategic Framework identified the site that is now the Science Complex hole as a location for graduate student housing. The Framework established height limits that are greatly exceeded by the Science Complex. Across town, a master plan was created a few years ago for the Fort Point Channel area of South Boston to create "a vibrant 24-hour, mixed-use neighborhood". But then last year the City approved plans for a very different type of development - the expansion of historic warehouses to create more office space. The Globe reported that "both properties are zoned for a mix of commercial and residential uses, developers say the current real estate market will only support office space." In spite of all this, I certainly believe there is value in long-term planning. At the same time, we are on the verge of a large, complex, and controversial development that won't be delayed indefinitely while we consider the distant future. There certainly seems to be more rats around here than anytime in recent memory, but of course it is impossible to prove what caused or sustains this surge. "Trust started to take root when the boundaries between the institution and the neighborhood dissolved, when people like me, who were administrators at Penn, moved into the neighborhood. For the first time, administrators would arrive at the campus, not by driving off the highway from the very rich suburbs at the front yard of the campus, but by biking or walking from the neighborhood that was at the time the back side of the campus. With this kind of fluidity between the neighborhood and the institution, a lot of problems get solved without having to create a committee, without having to issue one executive order or another." But when administrators and deans and vice presidents live in the neighborhood, you can’t criticize them as much because their kids go to the same school as your kids, and they have soccer practice together. Suddenly those relationships become more human — they are no longer institution versus neighborhood." For a long time I have admired the artistically painted utility boxes elsewhere, and now it is great to see them come to Allston. 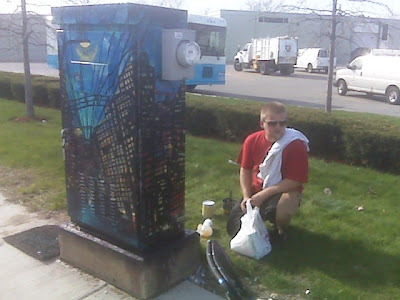 As part of today's Boston Shines, Allston artist Adam O'Day is seen here finishing his painting of this box on Western Ave near the intersection with North Harvard St. The May-June issue of Harvard's alumni magazine summarizes Harvard's financial problems and how they affect Allston, the Science Complex, and the rest of the university. I don't think it contains any new news, but it is interesting how they present the situation. "The willingness to incur such costs [moving the Stem Cell Institute to Cambridge and making labs for other scientists to Longwood] suggests the University’s eagerness to avoid the much larger costs—hundreds of millions of dollars—required soon to finish the Allston complex on its original schedule, with occupancy in 2011. While the financial markets and economy remain under duress, Harvard’s prospects for substantial further borrowing required to fund the project are constrained." "Harvard University, with a $30 billion endowment, voluntarily pays the city of Boston about $2 million on property that would, by one estimate, fetch about $40 million if taxed like a regular business. Boston City Councilor Stephen Murphy doesn't think that is fair. 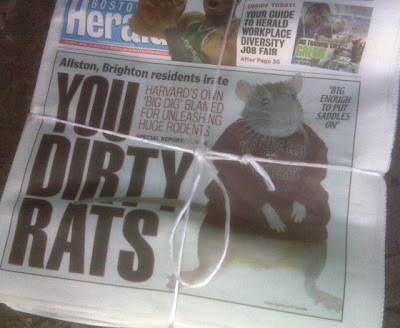 'They own Allston outright. They have just expanded into Allston, it's certainly not fair.'" The Friends of the Honan Library will be cleaning up from 8:30 a.m. and 12:30 p.m. to rake, sweep, plant and mulch. Even 1/2 hour of your time will be greatly appreciated and time well spent. There will be coffee and donuts in the morning and pizza at the end of the work shift. A Harvard senior joins the chorus of voices advocating greater investment, in Allston and Cambridge, during the downturn. "I believe this is a time for Harvard to spend, and spend handsomely, in order to seize another opportunity to improve its international reach, quality of education, and commitment to its ideals." Payments In Lieu of Taxes paid by non-profits in Boston is a perennial subject of interest in these parts. The PILOT Task Force, a non-governmental advisory bodyappointed by the Mayor to provide input on the PILOT process, isholding a public meeting in the Boston Room of the Boston PublicLibary's Copley Square location. Members of the public areencouraged to attend to learn about the work of the PILOT TaskForce and share their input on the PILOT process. Please direct any questions to Matt Englander at (617) 635-4797. Today is Earth Day, which makes it an appropriate time to consider the sustainability of North Allston, North Brighton, and Harvard's Allston campus. EarthDay.gov tells us that "Earth Day is a time to celebrate gains we have made and create new visions to accelerate environmental progress. Earth Day is a time to unite around new actions." What gains have we made? Is progress accelerating? Around what new actions can we unite? Harvard is incredibly enthusiastic about being green, green, green. High-profile green events at Harvard include the upcoming commencement speech by "U.S. Energy Secretary Steven Chu, Nobel laureate in physics and a leader in the pursuit of alternative and renewable sources of energy". Earlier this month Harvard hosted local and international speakers at its Ecological Urbanism conference, and last year 15,000 people heard Al Gore '69 speak as part of a "multi-day celebration of the University's commitment to sustainability." So it is disappointing that North Allston and North Brighton, whose public realm is so dominated by Harvard's presence, isn't making much progress toward becoming a greener and more sustainable community. While Harvard's 50-year plan is rife with suggestions of how green Allston will be in 2050, we haven't seen the 5, 3, or 1 year plans that show how that vision take steps towards becomes reality. There are a variety of reasonable projects that could and should move forward sooner rather than later and don't need to be held up by planning and negotiation over what may or may not happen decades from now. Repaving North Harvard St (which Harvard generously calls a "less suitable" bike route), adding ramps to the Weeks Footbridge, and improving the bike routes from Allston to Longwood come to mind. While none of these pieces of our infrastructure are owned by Harvard, it would be reassuring to know if Harvard was putting its considerable clout behind improvements like these. Ancedotally it doesn't seem like many more commuters are walking, biking, or taking public transportation to Harvard's existing Allston campus. Hopefully on Earth Day 2010 the progress report will very different, with meaningful projects completed in 2009 and more "shovel-ready" projects for 2010 & 2011 coming from the Community Wide Plan and elsewhere. North Allston and North Brighton have the potential to be green in so many ways and a lot of opportunity for improvement. The Globe laments that there aren't more bike paths being built in the state, but while bike paths are fine, and many people prefer to ride on them, but I doubt we will ever have a comprehensive network of them in Greater Boston. How about just cleaning and paving the roads we already have? In Boston, Cambridge, Belmont, Arlington, and many other towns where I often ride, the potholes, patches on top of patches, and sand and other debris along the edge of the road make riding a bike much less safe and pleasant than it could be. Maintenance isn't as glamorous as a new bike lane, but it would be a lot simpler and would make a huge difference. A scathing piece by a Harvard junior in the Crimson about Harvard's Allston expansion - Let Them Eat Cake. But how can a Finale kitchen with no retail component be a sign of gentrification? An actual Finale restaurant, maybe, but you'd never see a commissary on a main street of the South End, Back Bay, or other upscale neighborhoods of Boston. Instead of letting us buy and eat cake, it is more like "let us look at an unattractive little building where cake is made to sell to people elsewhere". Hill Memorial Baptist Church will once again be hosting a stop on Patriots Day morning for historical figure “William Dawes” on his ride to warn residents “The British are coming! The British are coming!” Dawes will dismount and recite a speech/poem before continuing his ride. The church will be open for those who wish to visit. There will also be a patriotic sing-a-long and refreshments will be available before Dawes arrives. All are welcome to join in this patriotic festivity. The church is at 279 North Harvard St. in Allston. A fire along the Charles River in Cambridge this morning was visible to many people in Allston and Brighton. 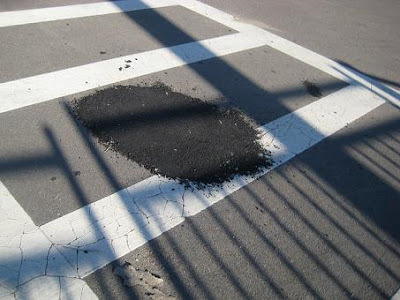 I was pleasantly surprised after filling out the City's pothole repair request form earlier this week and found it repaired less than two days later! Should a zoning variance be given to put another check cashing business in Allston? Also, the Boyne wants a 50-person outdoor patio. BRA Director John Palmieri spoke last night at the Harvard Graduate School of Design in an event sponsored by Harvard's Joint Center for Housing Studies. Thanks to the BU newspaper for letting us know some of what he said. Cambridge St. Proposal to replace in-house coffee service with Dunkin Donuts. Brighton Ave. Proposal to extend 24 hour "window" operation to in-store operation. Deep Ellum, Cambridge St. (Union Square) Proposal to extend hours of operation. A story about Harvard and a coffee company? No, it isn't about Harvard's quiet tenant on Western Ave, Espresso Express. It's Harvard grad Tom Keane in today's Globe decrying Harvard's contraction and lauding the expansion of the Swiss coffee company Nespresso. It's an interesting contrast with what Keane wrote last summer when he criticized Boston citizens and government for "picking on higher ed" and claiming that local universities get "kicked around" by people "demanding things we wouldn't really ask of any other bird." Keane is again contrasting universities and private businesses but now his pity for the schools (at least for Harvard) seems to have been replaced with a belief that Harvard should reverse its current trajectory in Allston and spend money, make plans, and move boldly forward. "So when a company such as Nespresso spends money and makes plans, it sends a message -- the bad times will end, growth will resume. If enough companies behaved the same way, then indeed, the economy would turn. Harvard, too, is sending a message. 'If Harvard can't build, who can?' worried one construction industry publication. Perhaps, many will conclude, no one can, and, as a consequence, no one will. This isn't to diminish Harvard's travails. But it's been around for 373 years and survived revolutions, wars, and other recessions. It's prominent and important enough that it needs to do more than play victim; it needs to be part of the solution. Nespresso, far newer to the scene, looks beyond today to the future. Harvard could learn something from the Swiss." The Boston Breakers open their season on Saturday at 7 at Harvard Stadium. Tickets range in cost from $25 to $13. This Globe story gives a balanced and realistic look at bike sharing in Paris and its potential in Boston. Allston and Brighton would seem to be an ideal place for it, with many younger residents and many people in apartments, many popular destinations a short distance away, and multi-family houses where owning and storing a bike might not be convenient. The manager of the Paris bike share believes that bike-share in Boston "must cover the whole city, not just the city center, with a station every 250 meters." That's a lot of stations - for example, Brighton Ave is 1,000 meters from Union Sq to Packard's Corner. Can you imagine 5 bike-rental stations in that stretch at the intersections with Allston St, Harvard Ave, and Chester St? Its nice to see BU opening its athletic facilities to the general public for an inexpensive ($5) introduction to racquetball. Join the Allston Brighton North Neighbors Forum to meet At-Large City Councilor – and candidate for Mayor – Sam Yoon who will join us for a Q&A. We will also discuss the upcoming planning effort focusing on the Brighton Mills Shopping Center, the Holton Street Corridor, and the future of the Charlesview Apartments. 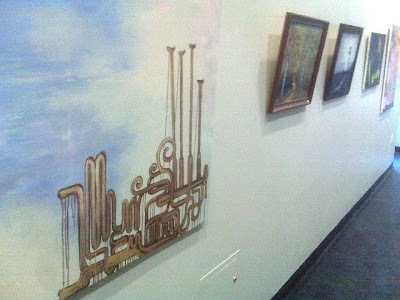 The Honan Allston Library is hosting the Allston-Brighton Art Exposition. Stop by to see a variety of art on display and for sale. Thanks to the neighbors, folks from the Allston Brighton CDC, and the Brian Honan Fellows who volunteered their morning today to clean up the Lincoln Street Green Strip. 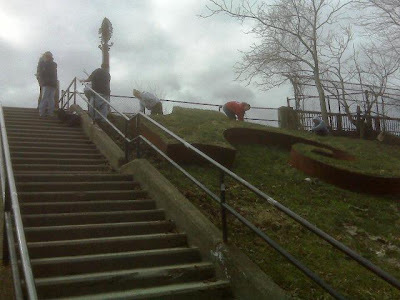 A lot of trash accumulates over the winter on the site, and it looks great after this spring cleaning. Courtesy of everyblock.com, I'm disappointed to see that the new housing on Litchfield St certainly won't be the kind of housing that will attract stability or permanence to our heavily transient neighborhood. Instead it will be 5 townhouse units that will probably look a lot like the ones shown here that were built on Adamson St a few years ago by the same developer who bought the Litchfield lot. Too bad the City allows this sort of development that contradicts the promises of the North Allston Strategic Framework to "preserve the essential character of North Allston’s residential areas" and "ensure the continued integrity and cohesion of the existing residential neighborhoods." These might be nice places to live for a couple years but I don't think too many families will live in one of these for any length of time. Would you want to live with your family next to something like this? There's going to be a lot less money for institutional expansion in Allston in the years to come. But partnerships with private developers for non-institutional projects (that don't require Harvard to spend anything) should, in theory, still be possible. Harvard, the world’s richest school, may slice a four-year, $4 billion spending plan to $2 billion to help it weather the recession, according to a Moody’s Investors Service report... The cut, as much as $500 million a year, sets back the university’s plan, initiated 10 years ago, to expand its main campus in Cambridge, Massachusetts, across the Charles River in Boston. 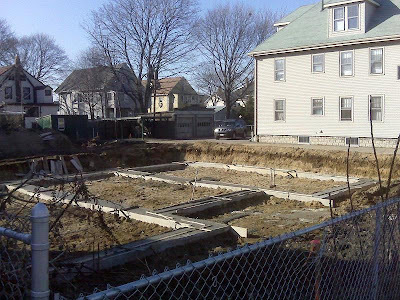 This 7,767 sq ft lot at 90 Litchfield Street is no longer the open yard it once was. The property was only assessed for $185,000, but it sold in December for $600,000 to Larosa Development, who has been described as "a developer known for flouting construction rules and regulations." I've written in the past about the City vastly under-appraising empty lots in our neighborhood, and it is a shame that as we are facing teacher layoffs and all sorts of other problems because of the city's budget problems the City continues to forfeit real estate tax revenue because it doesn't accurately assess property. As the last few open lots of greenspace in our neighborhood disappear, I wonder how and where the City is going to fulfil its promise from the North Allston Strategic Framework to "expand the limited number of neighborhood parks by creating new parks." Harvard has submitted its first report on its compliance with the Science Complex cooperation agreement.